When it is Friday, it is party! And as Halloween was close, our Friday night party, October 27th, couln’t have any other theme but Halloween. Jenny had proposed to have a contest for the best Halloween outfit and we set a reward of 3,000 L to be splitted according to votes. For this contest I reactivated a contest board which I still had in my inventory and that wasn’t used for years. Jenny decorated our beach disco using up all of our free prims. She made an awesome job! 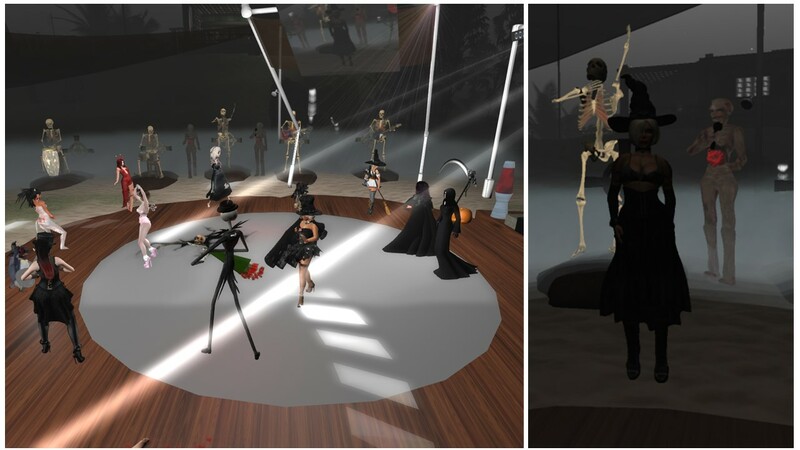 The dance floor looked really spooky and perfect for an Halloween party. We knew that some of our slaves and subs won’t be able to join. Among them was Kitty, who met with Jenny Friday morning. Kitty attended our party virtually as Jenny put up a picture of her, that she took that morning. The party was really outstanding. We had a full sim the first time ever and some guests who wanted to join couldn’t get into our sim as it only allows 20 people being present at a time. The contest was fun and I’m quite happy with it’s outcome. Virgo won the contest with 4 votes. Congratulations! She always selects the best music for our parties and music that does fit to the theme as well as the favourite songs of our guests and us. Thank you once again, Virgo. All others were dressed for Halloween also and made the party something to remember of, whether they got votes and rewards or not. Jenny and I really enjoyed. And of course, I took lots of pictures. Thank you everybody for joining the fun!